I don’t think I need to remind you, but blades and guns are not allowed in your carry-on luggage. 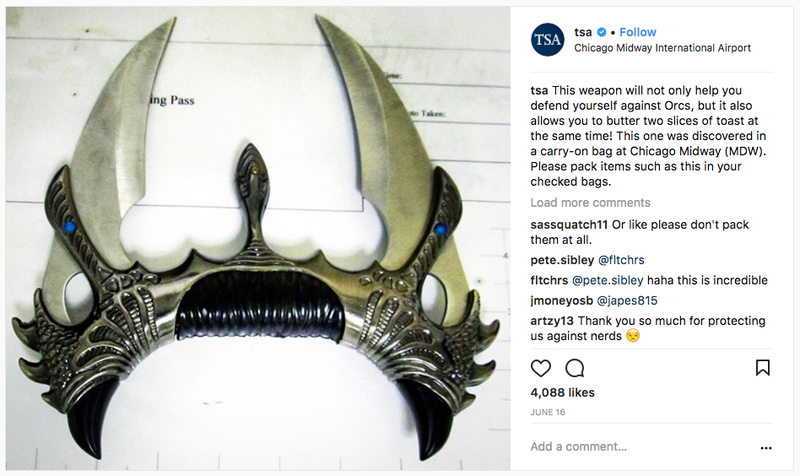 TSA will find it, TSA will confiscate it and TSA will shame you in a hilariously savage Instagram post. If you’re still not following them at this point, you should. It’s the best account. This year, there was an overwhelming amount of knives and guns. Blades of all lengths, shapes and sizes. Guns of varying calibers and types. And also... Batarangs! Who’s carrying around Batarangs (besides seriously cool people)? TSA is there to keep us all safe, but that doesn’t stop whoever runs this account from murdering us all with puns. I see what you’re doing and I love it.